Kit #72-A-10 and Defensive Position & Ammunition accessories. Historical Information: developed as an offshoot of a new 88-mm AA gun projects, this was a dedicated anti-tank (AT) weapon. It was a variation of the same gun used in the Tiger II and JagdPanther, as the KwK 43; and on the Nashorn and on the two wheeled split trail carriage as the Pak 43/1. Note that this LEVA Pak 43 gun cannot be used in a Nashorn, as the Nashorn's gun has a different recoil system & breach. Weight in-action was 3700 kg (8156 lb.). Traverse of 360 degrees and elevation of -8 to +40 degrees. It had an average muzzle velocity 0f 750 m/s (2461 f/s) for a maximum range of 17500 meters (19138 yds.). The gun can be modeled on all German fronts (except Africa) from 1943 to 1945. In a field artillery role its designation was 88 mm K 43. Suitable towing tractors would be the 8-ton halftrack SdKfz 7 (Hasegawa kit), a 6.5 ton truck (Art Toys kits) or anything else used for the Flak 18 and Flak 36 guns. 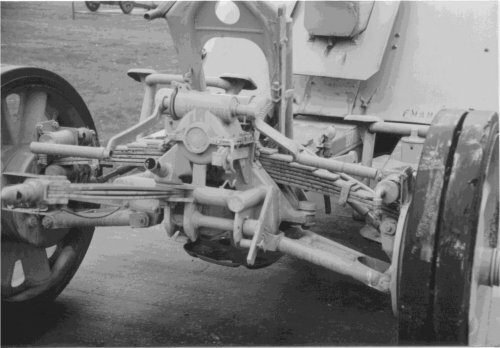 This kit comes with solid rubber tires and spoked wheels, though pneumatic tires may also be used, taken from Hasegawa's Flak 18 kit. 1. 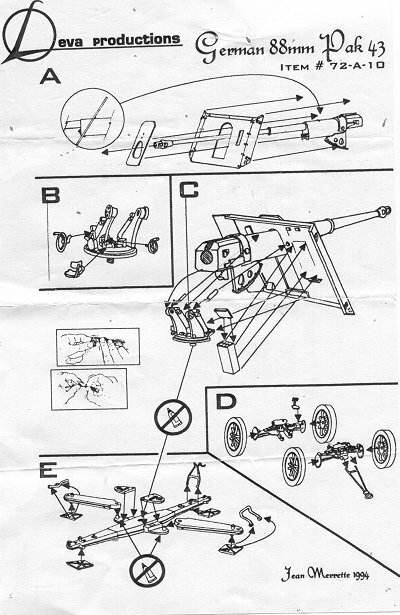 Two scans of the kit parts out of the package: gun, cruciform base with folding legs, shield, wheels, trailer bodies, seats, elevation & traverse hand wheels, etc. Removing the casting blocks and flash with a sharp hobby knife and fine saw posed little difficulty. The detail is very good for a static model and will make a good wargaming piece as well. 2. Breach-end view of LEVA's German Panzerabwekanone 43 (Pak 43) AT gun kit (72-A-10), assembled on its trailers but unpainted and before detailing. This kit comes with the two Sonderanhanger 204 (SdAh 204) trailers for motorized transport. The foldable cruciform legs can fold out. The gunner's seat and traverse and elevation wheels are included and well done. Except for the shield braces this is built OOB (Out Of the Box). 3. The kit instructions. Many resin kits come with no instructions so this is pleasant to see. 4. The SdAh 204 trailers removed and the gun ready for action. The gun and trailers are well molded in gray polyurethane resin and the parts not overly thick. Details such as some shield braces, winch handles and brake cables may be added. A less expensive version of the kit without the limbers (Kit # 72-A-10/1) is also offered by LEVA. A typical paint scheme for this gun would be a base of Dunkle Gelb (Panzer Yellow) as it was issued after the spring of 1943 and often with green and/or brown patches. The rubber tires should be dark gray in this scale, not black. 5. Photo of the separate Pak 43 ammunition assessory set (#72-E-15) which includes both boxed and tubed ammunition, loose shells, and stacked shells with shell rammers. This Pak 43 weapon used the same bottleneck shaped shells as the Pak 43/1 and the KwK 43 tank gun, unlike the shells of the 88-mm Flak 18 & 36 guns. 6. 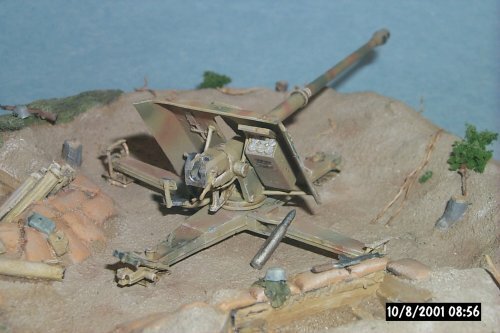 The gun positioned in LEVA's resin Pak 43 Gun Position base (Kit number unknown at present). 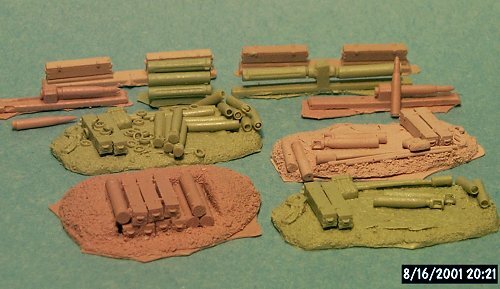 The one-piece resin base comes with Pak 43 ammunition (at right), camouflage netting (foreground), and sandbags (right background) molded in. The base is approximately 15 cm (6 inches) in diameter. 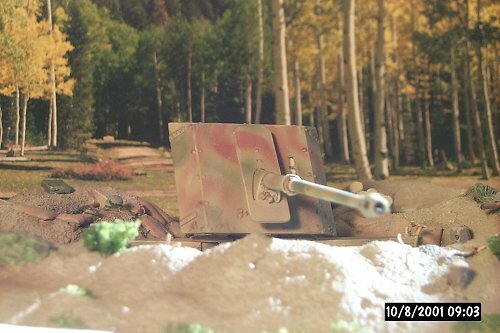 The base may work with a 1/72 or 1/76 scale Pak 43/1 kit (the gun with two wheels and split trails such as from TP Models) though may need some modification. The base may also work with Hasegawa's Flak 18 and Flak 36 kits. You can see that as a dedicated AT gun, and unlike the Flak 18 & Flak 36 AA guns, it had a low profile and could not rise to a high elevation. This was generally considered the best AT gun of WW2, though heavy and difficult to maneuver. 7. 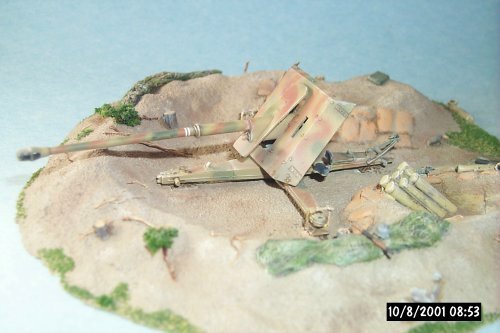 Breech-end view of the unpainted Pak 43 set in LEVA's base, which I have already painted. At far left are the 88-mm ammunition tubes. On the left side of the gun breech is the gunner's seat and handwheels. In the right foreground is a sandbagged dugout. Note the distinct weld seams on the sides of the legs. 8. 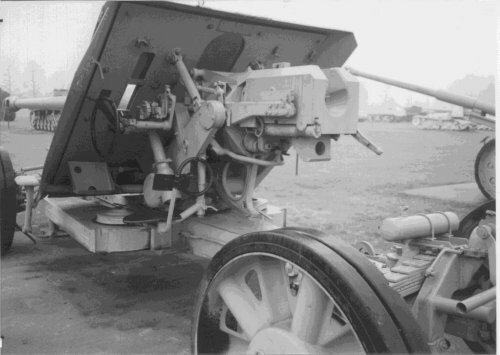 Photos of a Pak 43 located at the US Army's Aberdeen Proving Grounds in Aberdeen Maryland, USA. Some cables are missing though otherwise it is in great condition. In the background you can catch the long barrel of a Pak 43/1. In photos I have seen a number of variations in the gun's fittings and shield so I am not worried if the LEVA model does not exactly match all the available photos. German Artillery of WW2, Ian V. Hogg, The Crowood Press (1996). Only on German weapons: field, AT, AA railroad and fortress guns, few descriptions of captured weapons. Highly recommended. Aberdeen Proving Grounds, Aberdeen, Maryland. Personal photos of 1999 and 2000.